This years DU Film Festival was full of quality films, interesting talks and also a surprise last-minute speaker. Emily Thomas and Robyn Kilroy cover the goings on of the second and third day of the festival. Dublin University Film Festival’s second day certainly started with a bang. The committee had been informed that Oscar-nominated director Jim Sheridan would be in attendance just a few hours before the event started, and as I arrived the air was thick with nervous excitement. Known for films such as In the Name of the Father, My Left Foot and The Field, Sheridan had been invited to attend the event by speakers Pauline Cotter and Hilary McCarthy, who have attended DUFF since its establishment two years ago as representatives from Fastnet Film Festival. The schedule for the day was hurriedly revised, with competition screenings moved into the evening to allow for ample interview time with Sheridan. McCarthy and Cotter kicked off DUFF’s second day, discussing aspects of the Cork-based Fastnet Film Festival (currently in its 11th year) and emphasising the importance of bringing film crews to the area and supporting the local film industry. They also praised the DU Film Festival, crediting it with inspiring their team to establish an expanding student category. With almost 500 submissions this year (200 films make it to the final screenings) the festival is rapidly growing and establishing international relations, receiving films from as far away as Texas. Fastnet also promotes and encourages Irish filmmaking by holding workshops run by industry professionals, including Roddy Doyle and Academy Award-Winning composer Stephen Warbeck. When asked what the secret to a winning submission is, Cotter stressed the particular importance of a good story and good crew to go with it. She also joked about the notoriously bad lighting some student films fall prey to, and left the audience with a stern warning against trying to emulate daylight at nighttime. The moment the crowd had been waiting for arrived, and an almost full theatre put their hands together as Sheridan took to the stage to answer questions posed by DU film chair Hugh McInerney. Sheridan began by discussing his creative beginnings- working on plays in Trinity, he directed a show that was offered a stint in the West End, although declined as he thought of it as too conformist. These anti-establishment views came through during Sheridan’s reflections on the state of the industry: he lamented the popularity of Netflix and its role in crushing the individuality of national cinema. Irish stories are, he said, difficult to tell, and the Irish mentality in general can often be misunderstood by viewers abroad, with Irish anti-heroes difficult to make accessible to an outside audience. As a word of parting advice for the filmmakers present, Sheridan too stressed the importance of a unique plot, and that the best were simple and full of love. Emphasising the need for women’s stories to be told, the director left the stage accompanied by profuse thanks from committee members and thunderous applause from a delighted audience. After the break and some much-needed refreshments, the crowd relaxed and settled down to watch the Film Relay submissions. During the relay (set up by committee member Susannah Hunt) directors were each given the same lines of dialogue, but allowed free reign to come up with the film’s visuals themselves. Each director submitted their individual look-book to the committee for approval, and the films were shot in 5 hours using set equipment. The variety and creativity of the films produced were a testament to the skill of the directors: one focused on a mysterious kidnapping, while others told tales of angry octopuses and last-minute audition wardrobe malfunctions. The relay screenings were followed by a wide variety of competition shorts. Where’s Dad? An Insight into the Lives of Single Fathers campaigned against the “deadbeat dad’ stereotype and was followed by Family Spirit, a mockumentary on the life of a medium. Colin the Pantomime Horse closed the festival, providing insight into the life of a lonely pantomime horse trying to find his place in the world, and demonstrating the impressive variety of the selection and consistent high standard of the production. The event ran smoothly and efficiently, with DU Film’s welcoming committee taking surprises in their stride and facilitating a fun and informative afternoon for all involved. The sense of community was palpable throughout- the festival stands as a great platform to promote young filmmakers and support students looking to break into the industry. Day three of the DU Film Festival took place in Wynn’s Hotel on Abbey Street, a perhaps more relaxed day compared to the hecticness of Jim Sheridan the day before, despite some minor technical difficulties. However, organiser Hugh Conlon was all smiles throughout the day, stating that the festival had been full of “good vibes”, and claiming that first-time sponsorship for the event from Bank of Ireland had been a great aid. The third day of the event mostly consisted of the awards ceremony, where the best submissions to the festival received honours. The competition was judged by former DU Film Chair Allie Wheeland, TTV’s Erin Keogh and Conlon himself. An enormous amount of food was also served (thank you Bank of Ireland) and this reporter happily sat, ate chicken wings and enjoyed many great films. The ceremony began with the awards for Best Documentary, which went to Niamh Barry’s Boys Actually Do Cry, and Best Editing which went to Sara Manansala and Reilly Auville for Petite Mort. Petite Mort a charming yet chilling short film that tells the story of a young woman who discovers something rather sinister about the man she is sleeping with. The editing is sharp and at often times creative, so it is well deserving of the award. The next award, for Best Cinematography, went to Kyle Ohlendieck, for his stark and gripping style in Down the Barrel. Down the Barrel is about a boxer as he struggles to come to terms with the death of his opponent in the ring. This was then followed by Best Screenplay, which went to Gabrielle Deeny’s Family Spirit, a hilarious mockumentary that told the story of a medium who helps her friends contact their dead husbands, all while her and her daughter deal with the passing her husband. The writing was incredibly sharp in this film, and along with some superb candid acting it was a treat to watch. Best Director went to Susannah Hunt for her whimsical modern children’s tale Colin the Pantomime Horse, which is about a tap-dancing pantomime horse trying to find his place in the world. Colin has already had a rather successful gallop around some festivals, including the Waterford Film Festival and Feel the Reel International in Edinburgh, and Hunt seemed happy to be receiving such acclaim a little more close to home. The Best Actor category was a competitive one, however, and the award went to young Brandon Brownlee for his lead role in Carleton Rodgers’ The Jar. Brownlee’s performance was flawless in The Jar as he depicts a young boy trying to save up money to go to space school by filling up a big jar with money. There is no doubt in my mind that young Brownlee will go on to play many roles in the future. Best Picture went to Carleton Rodgers’ The Jar, making it the most successful film of the festival. Rodger’s film certainly deserves this honour, with its charming yet realistic story, great cinematography and clean editing, as well as some impressive child actors. I hope to see this film again in the future, along with any future projects from Rodgers. 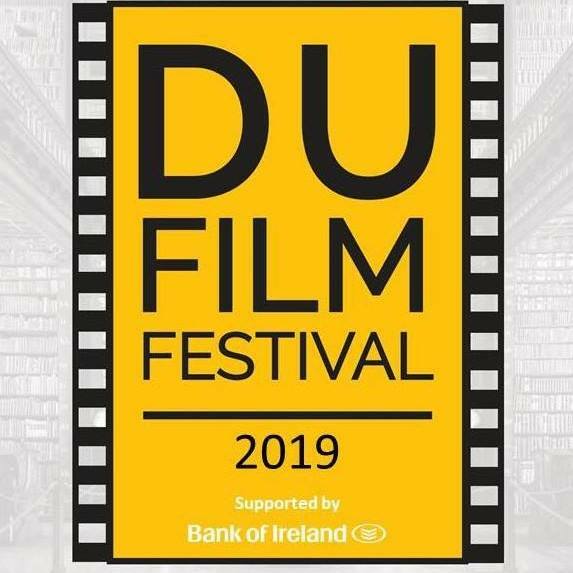 I’d like to commend and congratulate DU Film and Hugh Conlon in particular for putting together such a successful and impressive DU Film Festival this year. As one of Ireland’s biggest student film festivals, it’s an important column of student film culture in Ireland, providing young filmmakers to show their films and to gain recognition amongst the community. With the new addition of a sponsor for the festival, I hope that DU Film Festival will continue to grow, and be even bigger and greater next year.